Infrequently Asked Questions: What's the difference between cold brew and iced coffee? A standard Toddy-style cold brew is poured from a tap at a local coffee shop. Starbucks, Saxbys, Dunkin' Donuts — at this point, just about every shop in town, artisanal or not, is pushing out some version of cold brew. And, generally, is advertising it (if you haven't noticed by the price) as better than their iced coffee. But what's the deal? What's the difference between the two, and is one actually better than the other? We reached out to Ross Nickerson, the mechanical-engineer-turned-coffeemaker who opened the Italian Market's Function Coffee Labs in May. Cold brew is everywhere now, and everyone seems to generally be accepting that it's better than iced coffee. But what's the difference? And is it better? In a non-specialty coffee shop, 'iced coffee' might simply refer to their normal drip coffee — hot – being poured directly into a cup full of ice. This results in a very watered-down drink. In a specialty coffee shop like Function Coffee Labs, 'iced coffee' is done by brewing a stronger version of hot coffee directly onto ice. This is sometimes referred to as the Japanese method or the flash-cooling method. The ice melts as the hot coffee drips onto it, but since the coffee is stronger in the first place — achieved using more coffee grounds but the same amount of water, and/or grinding the coffee finer — then, when the ice melts, the resulting drink is at the 'correct' strength. Making a batch of flash-cooled iced coffee takes the same amount of time that brewing a batch of hot coffee takes, or roughly five minutes. So, it can always be served fresh, and there will be some of the pleasant aroma that a regular hot coffee has. Cold brew is a completely different thing. The coffee beans are generally ground very coarsely, and brewed in a full immersion method, like a French press, for 16 to 24 hours. The brewing water is cold, not hot. Unfortunately, many of the complex molecules in coffee that provide flavor are less soluble at lower temperatures. This means that less of the unique, interesting flavor that each coffee naturally has — which depends on where it was grown, the weather, how it was processed, etc. — ends up in the cup. So, most cold-brewed coffee tastes basically the same: sort of chocolate-y and caramel-y. 'Hot bloomed' cold brewed coffee is an attempt at getting the best of both worlds. A small amount of hot water is poured onto the coffee grounds and allowed to steep for a short amount of time, maybe 30 seconds, then the majority of the cold brewing water is added. This does allow some of the more interesting, unique flavor compounds to end up in the final beverage, but not nearly as many as using the flash-cooled method. Here, we actually very much enjoy the taste of cold brewed coffee, but we feel like it is a waste of the potential of a great coffee bean. On the flip side, if you have some cheap commodity-grade coffee beans, cold brewing them is a great way to make them taste not terrible. We brew a small batch of hot-bloomed cold brew each day so that we can let customers taste the difference. The vast majority prefer our iced coffee. You mentioned the grounds being in the cup when doing cold brew. Is that why I always find that surprise at the bottom of my cold brew cup? Why do traffic jams seemingly start and stop for no reason? Why do disposable coffee cups still leak? Most cold brew is done in a way very similar to, if not actually identical to, brewing in a French press. The coffee grounds just sit in a container of cold water for many hours, with some of the coffee flavor slowly dissolving into the water. When the brewing is finished, the grounds need to be separated from the water. The metal filter — or various types of paper/cloth filters — usually allow some of the grounds through. What's an ideal coffee bean for cold brew, then, if most are going to taste the same? The cheaper the coffee, the better. They will all taste sort of like chocolate and caramel, which is really pleasant. We wouldn't recommend using a specialty-grade bean because you won't taste any of the unique and interesting flavors that make the coffee special. Why do you think cold brew is suddenly catching on? It sounds like iced coffee can be done right without the cold brewing method. 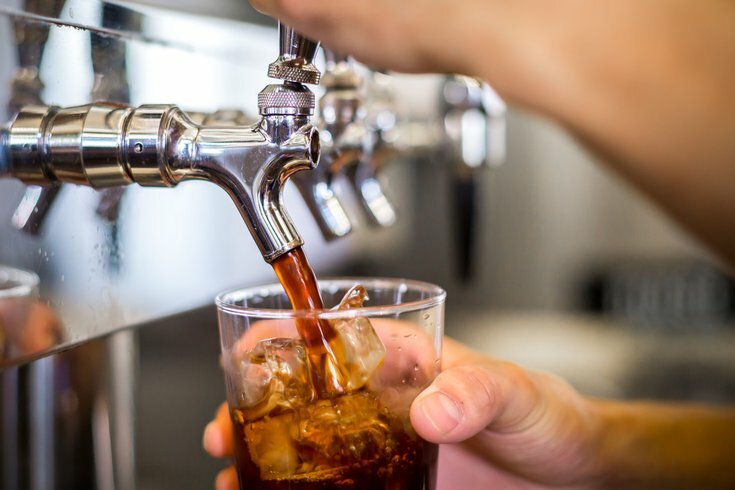 Cold brew is catching on because most shops are either using cheap coffee beans that don't taste good no matter how they're brewed, or they are brewing their iced coffee incorrectly with good coffee beans. So, it's a safer bet — you know exactly what your beverage will taste like. Maybe this is naive, but I always assumed the water would have to be hot to brew the beans. How's the cold brew actually brewing in a colder temperature? The water needs to be hot to extract many of the complex molecules that provide flavor. Cold water can extract some of the flavor molecules, but not nearly as many as hot water can. Imagine soaking a food in cold water. You'd eventually get some of the flavor into the water, but not nearly as much as soaking it in hot water. The hot water provides more energy for the dissolution process. Try both an iced coffee and a cold brew at a specialty coffee shop — blind, if you can manage it. See which one you like better!